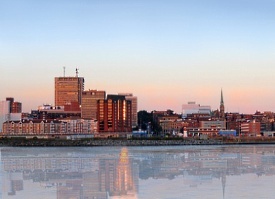 Saint John is located in the southern portion of this Canadian coastal province, where the Saint John River meets the Bay of Fundy. Historically, the city has been a hub of commercial port activity, and attractions like Old City Market, Market Square and an abundance of museums pay tribute to that tradition. The outstanding New Brunswick Museum is the oldest continuously operating museum in Canada. Rockwood Park, in the heart of the city, houses a zoo, a golf course, freshwater lakes and hiking trails. Look for the famous Reversing Falls, a phenomenon caused by the enormous rise and fall of the tides in the Bay of Fundy.